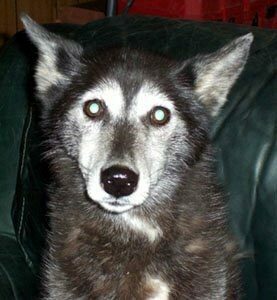 Question from magazine: As a past sled dog handler, do you believe that all long-distance mushers practice inhumane dog handling treatments or just those that have been in the news due to dog deaths, inhumane kennel practices, etc.? Ashley’s response: There are many standard practices in the sled dog industry which are in fact harmful to the dogs. 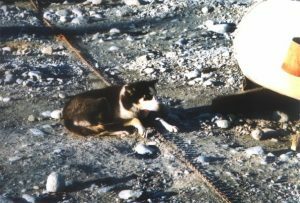 For example, most Iditarod mushers tether their dogs. Dogs who don’t make the main teams are never even taken off their chains. Tethering is cruel to dogs, which is why many places across the United States and Canada have banned or severely restricted the practice. We do not support racing dogs in extreme endurance events, nor do we condone the husbandry methods which long-distance mushers, as a whole, practice. Question from magazine: As someone who used to participate in the mushing world, what made you change your mind against supporting the Iditarod and other mushing races? Do you support shorter distance sled dog sprint races? A dog named bug. Ashley Keith saved her life. Ashley’s response: I handled at multiple Iditarod, Yukon Quest, and Beargrease Champion kennels. I’ve been involved in the sport for nineteen years this coming January. I even used to race. My dream was to run the Iditarod. But after traveling throughout the Midwest and New England to so many kennels, trade fairs and races – I was very upset by the accepted cruelties in the sport. What finally made me walk away from the competitive side of things was handling at a multi-Champion Iditarod kennel in Alaska. This musher was supposed to be an industry leader. And what I witnessed in my few short weeks there were the worst kennel conditions and husbandry techniques I had yet to come across. I finally cut my losses and booked a flight back home after I pointed out that an older dog was not eating, was dehydrated, had no bedding (none of them did – in Alaska, in November), and appeared to have intense abdominal pain. After reporting this to the musher for two days and insisting something be done, the dog was taken out back and shot. Question from magazine: Why does the Sled Dog Action Coalition oppose the Iditarod? Ashley’s response: As of January, 2017, at least 147 dogs have been run to death or have died from other causes in the Iditarod. From 2002-2015, an average of only 51% of the dogs that started the race finished. An arthritic Iditarod dog lying on the cold ground in November, with no bedding in his house and no water in his rusty excuse for a bucket. This photo was taken at a Champion Iditarod kennel with over 200 dogs. Question from magazine: Are you against the race, the training methods, how young dogs are raised, how dogs are housed or all of the mentioned? Ashley’s response: We object to all of the aforementioned. In many states the training methods are considered to be overdriving or overworking an animal. Typical sled dog houses do not meet minimum requirements for dogs kept outdoors per animal cruelty laws. There’s a myth that sled dogs are immune to the cold. 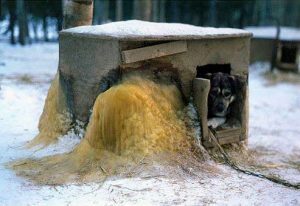 Regardless of how sled dogs are housed outside, they get terribly painful frostbite and some have frozen to death. Plastic, metal, and wood shelters provide little to no relief from the hot summer sun. And, they certainly don’t protect dogs from swarms of biting insects.